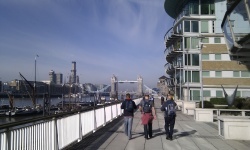 A 30 mile challenge walk across London from East to West. 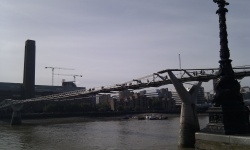 This walk should prove to be an real insight into London and challenge all at the same time. We will be taking in some of the most impressive and popular landmarks of the city as well as seeing some of the lesser known but equally interesting parts of this fantastic capital city. Starting from the wide open expanse of Blackheath, we shall begin our day's challenge. We shall drop down to the river, and then take a journey through history, and learn about our world famous capital as we trek. Our route will take us through the old docklands, across Tower Bridge, via the City, and The Monument, the Southbank, and then onwards via the west end, The Houses of Parliament, and finally out towards leafy west London, and its riverside parks, its rowing clubs and maybe even time to stop in one of those myriad of riverside taverns. In total we expect the trek to be around twenty eight miles, and for those serious challengers who rise to the undertaking, and complete the event, this should take around ten or eleven hours. NB there will be ‘check-out’ points at 18 & 23 miles. Meet for challenge briefing - 08:30 - beside Blackheath Church. please note - that challengers must reach this point by a pre-set time - (or their challenge will complete here). End of the challenge - expected - by 18:30 - where we shall convene in a riverside tavern to discuss the day's events, and celebrate! Lunch. Transport to and from the event. At this time of year the weather could go either way from warm temperatures to cold – so be ready for anything – make sure you pack according to the list! Remember that layers are the key, allowing you to adjust your level of warmth more easily.We may well experience some rain during the weekend, so make sure you have suitable waterproof gear—both top and leggings.